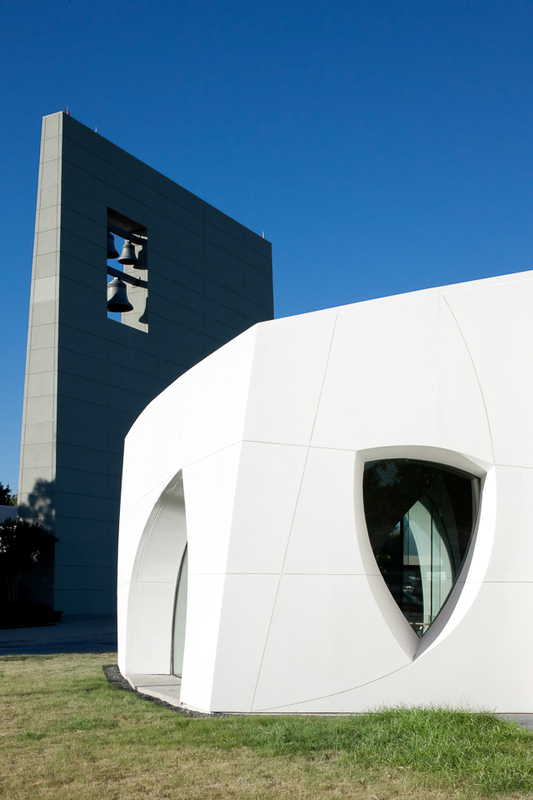 The 8,000-square-foot chapel stands as a signature building in its own right, but Johnson had intended it only as a secondary building in his grand vision for the Cathedral of Hope, one of the largest predominantly LGBT congregations in the country. The centerpiece of Johnson’s master plan was a 2,200-seat cathedral that has never been constructed. A bell tower in memory of HIV/Aids victims is the only element of Johnson’s master plan that was built during the architect’s lifetime. The Peace Chapel was completed in 2010—five years after Johnson’s death at age 98. 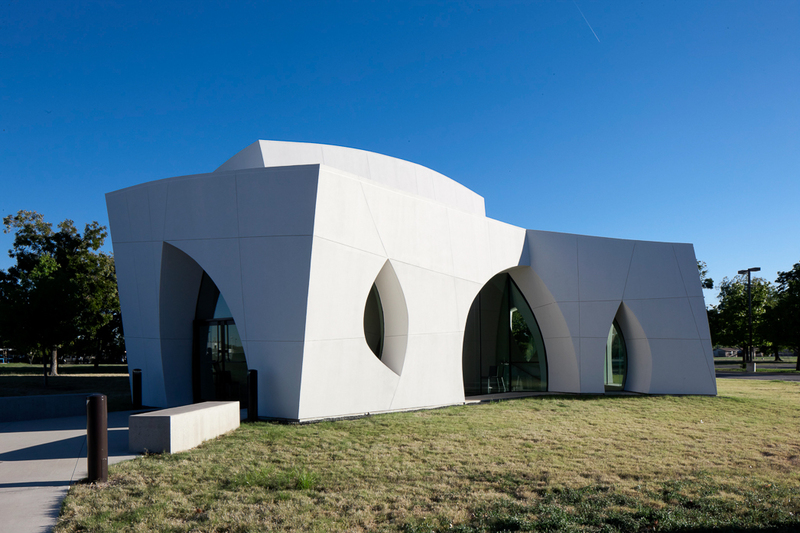 The chapel’s sculptural form creates a quiet sanctuary under the flight paths of nearby Dallas Love Field Airport. The curving walls intentionally reject the norms of traditional church architecture even while symbolizing the chapel’s interfaith mission. The building is meant as an inclusive place of worship or ceremony for those of any belief system—or none at all. It is a fitting memorial to Johnson, who was openly gay and agnostic. 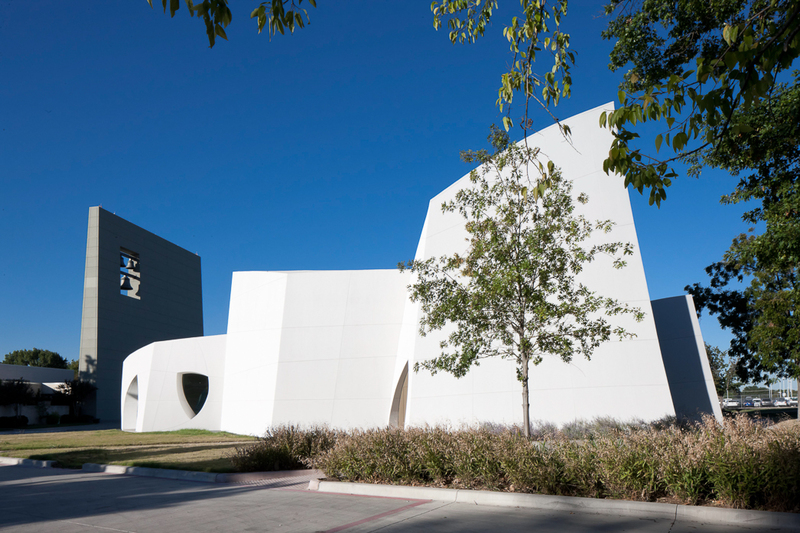 Cunningham Architects of Dallas worked with Johnson’s firm—Philip Johnson Alan Ritchie Architects—to bring the chapel to life in 2010. Cunningham developed the construction documents from a digitized version of Johnson’s hand-crafted model and oversaw construction of the chapel—a complicated endeavor given that the walls and windows have no parallel lines or right angles, and the inner and outer faces of the walls have different geometries. The warping walls were constructed of separate inner and outer skeletons of pre-curved cold-formed studs and an outer skin of cement plaster. The structural engineer was Thornton Thomasetti and general contractor was Structure Tone Southwest. 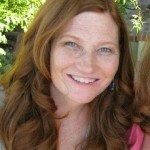 Landscape architecture is by The Office of James Burnett. Contributed by Cindy Smith, AIA, an architect with Gensler.